Part of our local watershed, Cabin John Creek flows under the MacArthur Blvd. bridge. I spend a lot of time enjoying Rock Creek Park, which runs alongside my Kensington neighborhood. I drive through it every day on my way to work. I run and walk regularly on the Beach Drive path. I have enjoyed the playgrounds and wetlands with my children and friends. I love it. 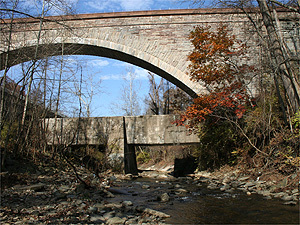 Rock Creek is an oasis of natural beauty in the midst of our highways, lawns, houses, supermarkets, and sports fields. But sometimes, when the rains (and snows) are heavy, Beach Drive is closed due to high water, which reminds me that our suburban sprawl is a real threat to this precious natural wetland. We are slowly edging out the Potomac River’s natural filtration system of forests and wetlands. Right now the water is running fast and the marshy grass along the creek’s banks is pocked with huge puddles. And all of our runoff — fertilizers, pet waste, de-icing chemicals, and other pollutants — is headed straight for the Potomac River (our main source of drinking water) and the Chesapeake Bay. According to the Interstate Commission on the Potomac River Basin (ICPRB), of the 14,650 square miles in the Potomac River watershed, 57.6% is forest; 31.8% is agricultural; 5% is water or wetlands (like Rock Creek Park); and just 4.8% developed land. While agriculture and development play important roles in our community, it’s important to understand their far-reaching affects on the local watershed. Everything we do on land has an impact on our river, which is the source for 90% of DC’s drinking water; in fact, 486 million gallons are taken out of the Potomac every day to provide drinking water for 5 million people in the DC metro area. We need to protect our river. Julie Clendenin grew up in Montgomery County and is happily raising her family here with her husband, Tom. She enjoys having unlimited access to Rock Creek Park; tasty, cold water from her kitchen tap; and swimming in the ocean. Recent anti-pesticide laws enacted by local jurisdictions have moved members of the Montgomery County Council to examine the county’s current pesticide practices, both public and private facility management and lawn care/landscaping services, but not in farming or agricultural land uses. DC’s Pesticide Education and Control Amendment Act was passed unanimously in August 2012. It restricts non-essential “cosmetic” pesticides from all government-owned property and restricts the use of pesticides on private property around schools and child-occupied facilities and properties next to waterways. In July 2013, Takoma Park, MD City Council passed unanimously “Safe Grow Act of 2013,” which restricts the use of certain pesticides on all city-owned and private property within the City. In the Kentlands neighborhood in Gaithersburg, the community is considering alternatives to synthetic pesticides currently used in the common landscaped areas after concerned residents brought up health risks to exposure of these synthetic pesticides that are applied every fall and spring. In 2011, the Kentlands Citizens Assembly voted to stop spraying pesticides in tot-lots due to residents’ concerns of pesticide exposure to children. The other concern is that the pesticides also run off into the local Muddy Branch stream and that local drinking water health suffers. Montgomery County Council member George Leventhal, who chairs the Council’s Health and Human Services Committee, requested a discussion and presentation on September 9 at the Council’s Transportation, Energy and Environment Committee to inform the Council members about the county’s current practices, to hear testimony from Takoma Park and DC legislators, and to hear from people that are for and against local legislation. Alex Stavitsky-Zeineddin is the founder of Green Gaithersburg, a member of the newly formed Chesapeake Greens Collaborative, a coalition of environmentally friendly organizations that promotes sustainability and sound environmental practices in our communities.